Our rolling, unscientific biofuel experiment has crossed into the great state of Mississippi – rocketing (joke) toward Oxford and the University of Mississippi. 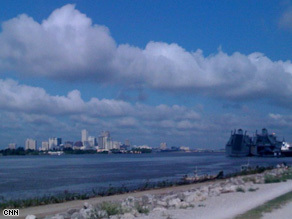 Behind us, New Orleans, where we filled up on B5 biofuel at a station in an industrial district. We’re still getting around 23 miles per gallon and we’ve traveled about 3,500 miles since this two-week adventure began on July 28. The engine inside our 30-year-old Scout is running great. Mostly because we haven’t been running higher concentrations of biodiesel fuel. So... how are we holding up during this grueling marathon of driving, reporting, sleeping, waking up and repeating? We’re making it. Last night’s camping experience at the KOA West in New Orleans wasn’t very restful. We didn’t realize that the campground is near a railroad track. Three-minute-long whistles from passing trains kept us up. Cody probably got an hour-and-a-half of sleep and I got four or five. We apologize if our lack of sleep affected our interview this morning with Tulane's Prof. Douglas Meffert, who talked about a project to build river turbines to power the city's Lower Ninth Ward. Weather: Muggy. Sadly, as many of you know, this truck has no working air conditioning. For breakfast we stopped at Starbucks for pastry and a coffee. That’s the only thing we really had to speak of today. But we’re meeting my parents for lunch in Jackson this afternoon and we’re looking forward to joining in the Hotty Toddy in Oxford with Ole Miss fans later tonight and Friday. If you’re on campus tomorrow at about 8:30 a.m. CT, come and say hi. We’ll be set up at The Lyceum. Ya' all know you are in Mississippi? 🙂 I'm surprised the families aren't waiting on the side of the highway with the table set for your for dinner. The folks there are pretty generous in greeting newcomers with delicious Southern food. I'm not sure if your anywhere near the river that bridges to Memphis, Tenn. but if you are take a break and go on the rail across the river to MUD ISLAND it's quite an adventure. Cody, someone asked in previous blog what kind of money you are spending using bio in comparison to our typical gas. Can you share this info (gerneralized)? Stop in Biloxi and we'll go hit up the hard rock casino!! Just thought you shulod know that when I clicked on the map for the Uxbridge store location it took me to map quest and the directions were for your Bloor Street store.